I'm sure that some of you are aware of the rebranding campaign recently launched by retailer JCPenney. Evoking the marketing strategy of fellow-retailer Target, JCPenney aired an attention-grabbing commercial in January that featured men and women screaming in frustration at having to jump through hoops in order to take advantage of sales, deals, and promotions. The commercial promised change come February 1 and directed viewers to the JCPenney Facebook Page for more information. Then the eeriest thing happened. A publicist for the brand emailed me and inquired about my interest in partnering with JCPenney and shopping the new JCPenney. I didn't mince words and came right out and told her that I was hesitant about the idea because I hated their "Nooo!" ad so much. She informed me that new commercials were set to run in conjunction with the February 1st launch of the new campaign, commercials designed to better represent the brand's new direction and commitment to "fair and square" pricing. I was intrigued. I reserved final judgment about JCPenney's marketing efforts and agreed to participate. JCPenney generously provided me with a $200 gift card to purchase my "jcpfinds" from any department in the store. Obviously, I set off with the goal of spending most of that gift card in the Kitchen & Dining Department. Parking at the Lehigh Valley Mall tends to get a little crazy on the weekends, so I strategically planned to start shopping earlier in the day. Doing so allowed me to have my pick of parking spots once I arrived. Perfect! Upon walking through the door, I couldn't help but notice the prominent display of the new pricing policy. Utilizing a patriotic red-white-and-blue color scheme, consumers get a clear explanation of what to expect once they enter the store. I was immediately struck by how bright and colorful the store looked, a pleasant departure from the way the store looked prior to the kickoff of the rebranding campaign. And the departments didn't feel as cramped and cluttered as they used to. A definite improvement. My eye was immediately drawn to a display of enamel cast iron Dutch ovens in gorgeous colors fit for spring. Because Dutch ovens tend to be on the more expensive side, I've been holding off on buying one, tagging it as something to add to my wedding registry. But then I noticed the little sign that indicated that the Dutch ovens were on sale for the entire month of February: $35 for a 3.5-quart oven, $50 for a 5-quart oven, and $70 for a 7-quart oven. Would this be the day that I'd finally bring one home? I decided to walk through some of the other departments before committing to anything. The patio furniture on display made me long for a house with an actual yard. While we have a deck on the back of our current house, it's simply not large enough to fit anything like this. I mean, doesn't that Seacrest Modern Lounger (everyday price of $1,100) look like the perfect place to lay with a good book and a cool drink? The longer I stood there staring at it, the more I imagined Stephen and I being able to take naps on the lounger on lazy weekend afternoons. I had to keep moving. I moved right down to the Shoe Department. Surprisingly, a good number of people were milling around the department, checking out the merchandise, and waiting for the sales staff to assist them with pulling the appropriate sizes from the storeroom. I took a quick peek at the boots before walking over to the Handbags & Accessories Department. Naturally, the vibrant color of these Liz Claiborne Perfect Fit Shopper Bags (everyday price of $32) attracted my attention. I'm embarrassed to admit that I spent an inordinate amount of time choosing between the various colors. That involved putting each bag on my shoulder, looking at myself in the mirror, walking around while wearing the bag, and, finally, asking perfect strangers for their opinion. I ultimately picked the blue bag, described as "Soothing Sea", and cannot wait to plan its debut in the spring! While shopping, I casually eavesdropped on the conversations happening around me, and it seems as if the general consensus about the handbags was negative. Despite the spaciousness of the handbag section, the selection was limited. These women were expecting more. Even though I found a handbag that I loved enough to buy, I have to confess that I agreed with them. I would have loved to have seen a more substantial selection of clutch purses and evening bags in the store. Other items procured from the Handbags & Accessories Department include a reversible leopard print/black belt (everyday price of $10) and a black Pashmina wrap (I purchased it at the everyday price of $12, but this wrap is currently being sold as a March-long value at $9). Okay... But what about those things for the kitchen I set out to buy? Did I wind up getting a Dutch oven? You bet your sweet bippy, I did! A 5-quart Dutch oven on sale for the month of February for $50? There's no way I could walk away from a deal like that! A little bit later, I found adorable blue-and-white checked kitchen towel sets (everyday price of $8) to replace the ratty (sorry, Stephen, but it's kinda true) kitchen towels that have been in use in our kitchen since the beginning of time. In a dinnerware experiment, I bought four new cereal/soup bowls -- two red and two green (everyday price of $7 each). I didn't want to go overboard since we'll be registering for new dinnerware in the near future, but I've wanted deeper cereal/soup bowls for a while now, so I totally went for it. Truth be told, I now use those bowls for everything. Even when a plate is more appropriate. And, lastly, in effort to kick myself in gear in terms of the pantry makeover project, I bought two sets of Lock & Lock Food Storage Containers (everyday price of $20). Our pantry is a mess and our food storage containers are all over the place. Matching lids are difficult to locate when we need them, and frankly, I've had enough. Now that I have these containers, I'm going to purge every plastic container that's currently in there. And I'm going to enjoy it. All in all, shopping the new JCPenney was pleasant. I always tell Stephen that shopping is mentally exhausting -- calculating percentages, remembering the price of something in one store versus another, etc. It was nice not having to worry about that while shopping at JCPenney, and it was easier to keep a running total of how much I had already spent on the gift card. In case you were wondering, I walked out of the store with $1.32 left to spend. Go me! - There were some items that weren't marked with a price and that didn't have a sign nearby explaining how much it was. For those items, I had to search for a price checker so I could scan the barcode on the package to get the price. Not exactly convenient. - It was difficult to hold all of the items I had planned to purchase while walking around the store. They didn't have shopping carts or hand baskets available. Just fabric/mesh bags with handles. Great for holding linens or lighter objects, but not so great for holding breakables or heavy appliances or cookware pieces. - The women's clothing department needed Help. It wasn't as neat and clutter-free as the other departments, and I'm not sure why. Clothes were strewn all over the place, in the aisles, even. Definitely made for an awkward shopping experience. So... If that initial "Nooo!" commercial turned you off from the idea of shopping at JCPenney, I'd urge you to reconsider. The new pricing system makes sense and some of the monthly deals really are worth it. 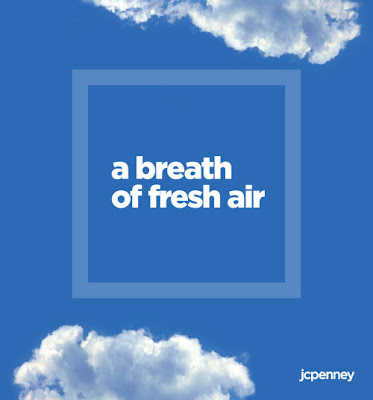 In general, shopping the new store really was "a breath of fresh air," so consider stopping into your local store to experience it for yourself! Taste As You Go Disclaimer: I was provided a $200 gift card from JCPenney to shop the store and did not invest any of my own money in the endeavor. I did not accept monetary compensation for writing about the products featured in this post or about my experience while in the store. All opinions expressed are my own.